Nowadays, when thinking of traditional Japanese bindings, stab bindings are the ones that come to mind. 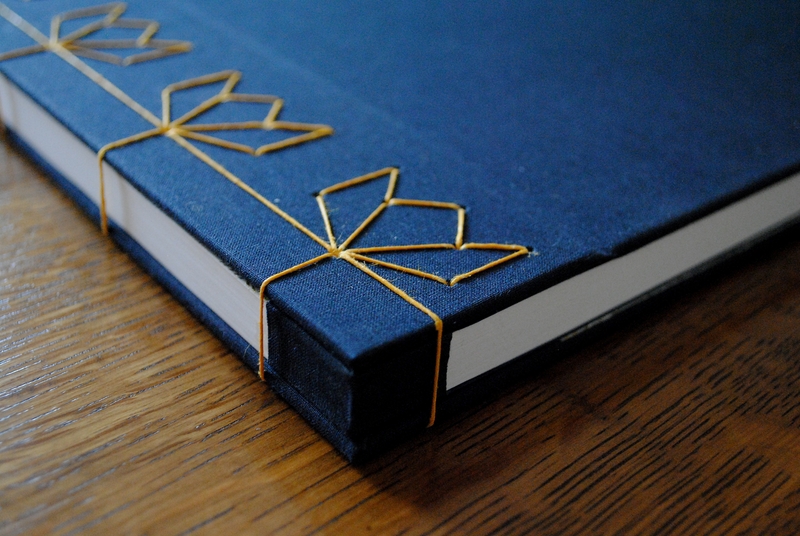 Originally coming from China, this binding style flourished during the Edo period (1603-1868) in Japan. 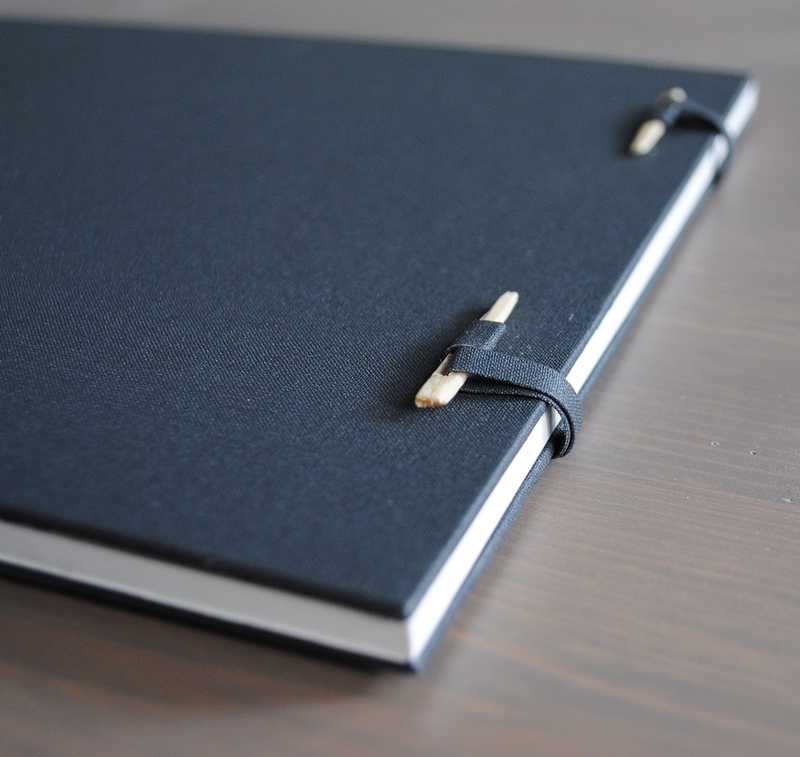 These bindings offer many advantages, such as being quick to realise and requiring a restricted amount of tools, while achieving an elegant and aesthetically pleasing result. 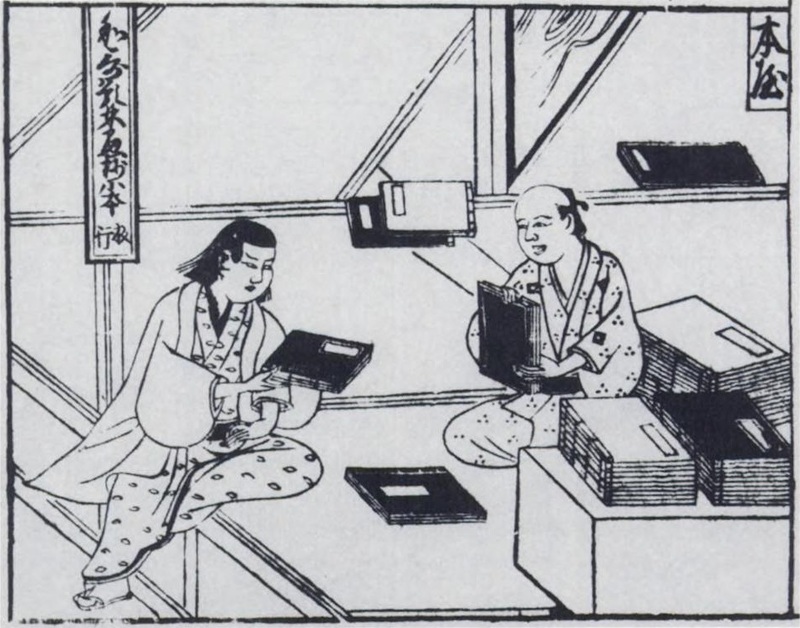 Japanese bookseller from Jinrin kinmo zui, 1690. National Diet Library, Tokyo. 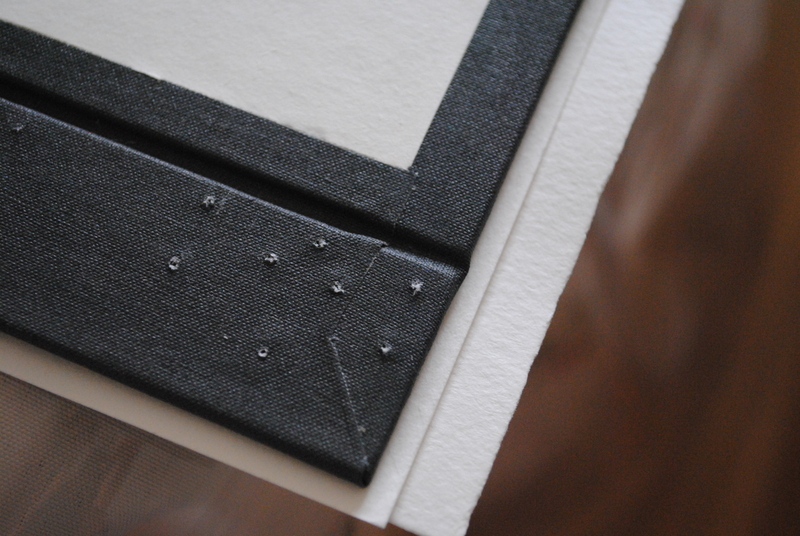 This modified Japanese binding was designed to fit the purpose of becoming an A3 size wedding-album. 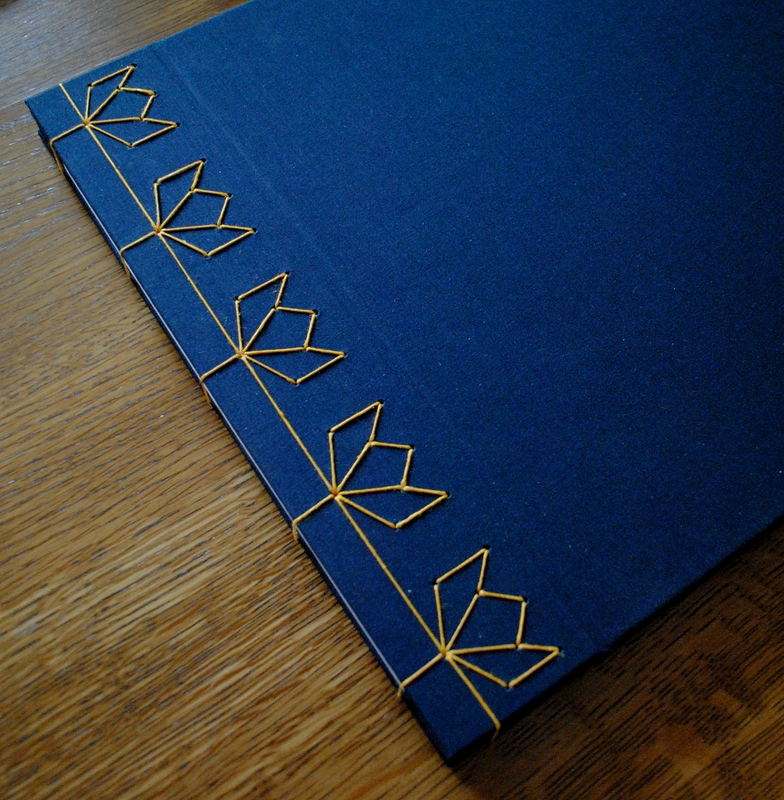 In preparation for the binding, I first made an A4 version, using similar materials and techniques. Instead of decorative paper, millboards were therefore selected to withstand repetitive openings and add some pressure to the textblock. Bone clasps, usually found on enclosures, were also added to insure further pressure on the fore edge while also becoming decorative elements. 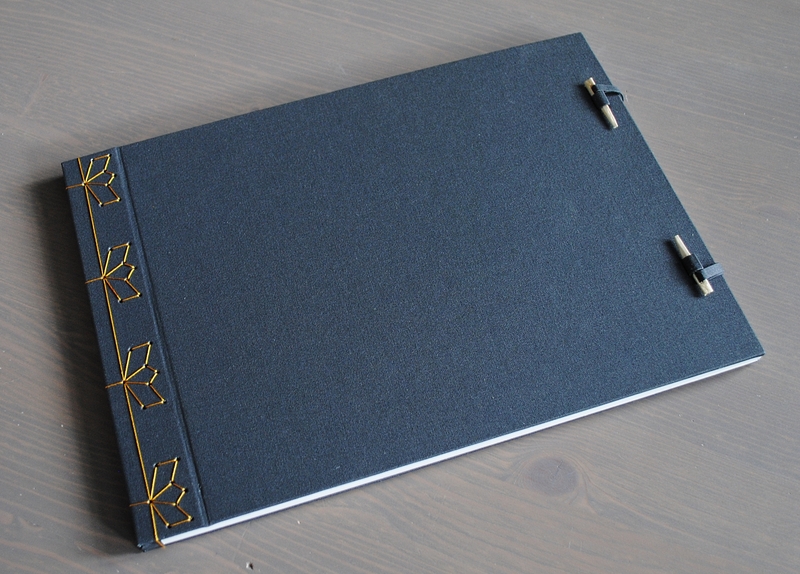 For the rest, the binding followed a traditional pattern. 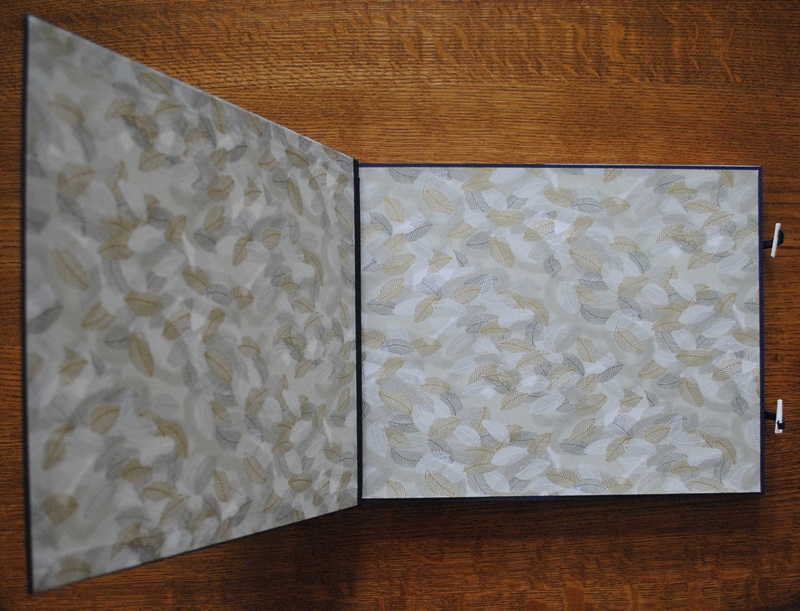 The textblock, decorative silver and gilded Japanese endpapers, and boards were first cut to dimension and squared. 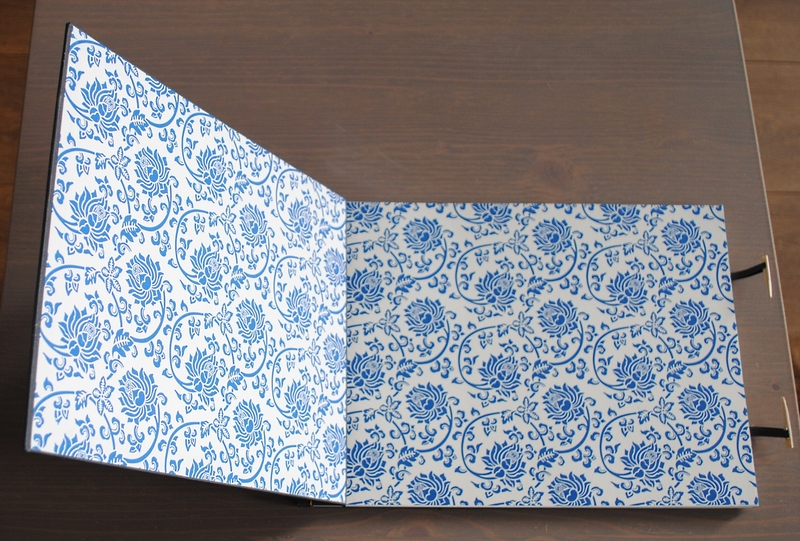 The upper board was then divided in two parts, with a spine piece allowing a wider opening of the album by creating a joint. The sewing holes for the inner and decorative bindings were then measured and marked in pencil, before being drilled throughout the papers and boards. 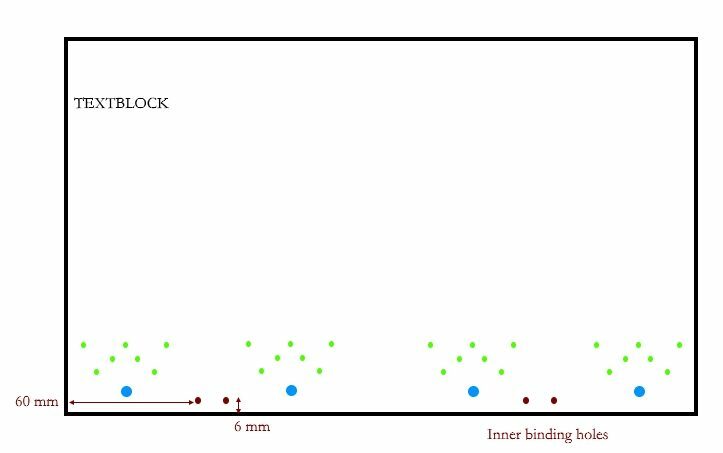 Positions of inner binding holes and decorative holes. 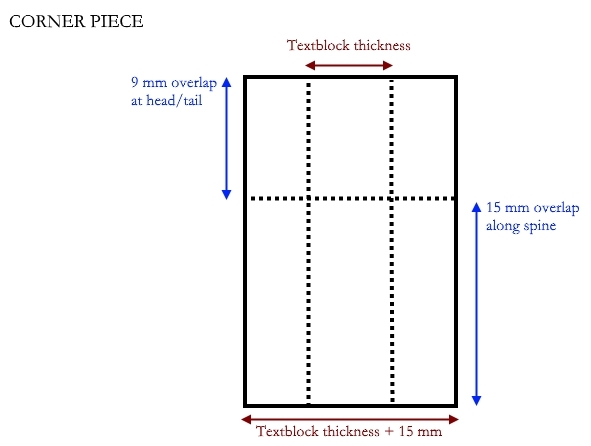 The measurements given here are for an A4 binding size. The boards were then covered with cloth, and the loops and bone clasps were inserted. The pastedowns were adhered and the boards could then be set aside. Covering corners with cloth. A4 album. Bone clasps and loops. A3 album. 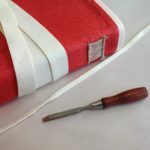 The inner binding was then sewn using a natural 18/3 linen thread. 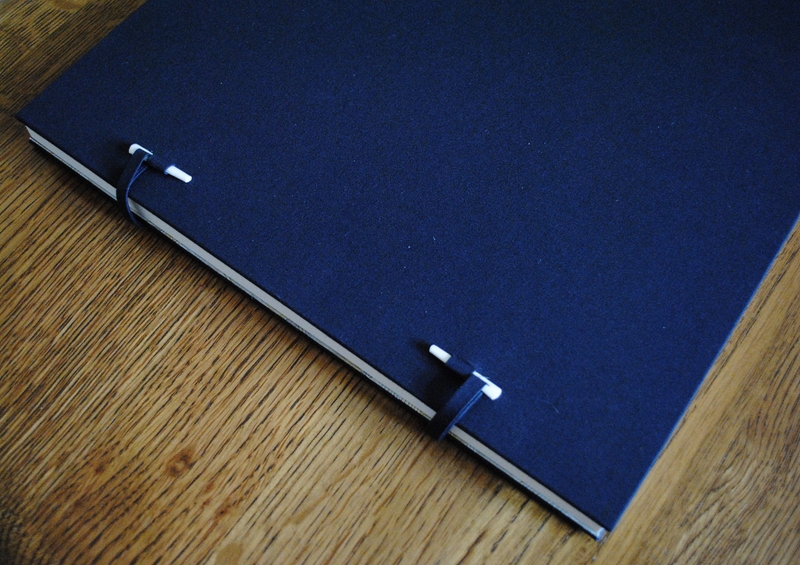 The corner pieces were cut in the same cloth used for the covering, folded and adhered on the spine edge corners. Corner piece template. The measurements given here are for an A4 binding size. Corner piece, detail of A3 album. 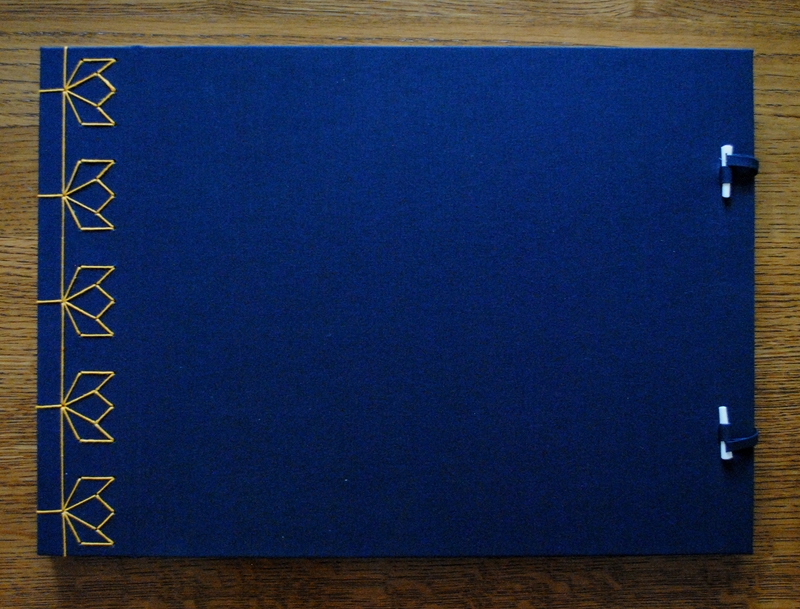 The sewing was based on a traditional four-holes binding, extended in this instance in a five-holes binding with floral additional decorative holes. Instead of a thin embroidery silk thread, a stronger 18/3 yellow died linen thread was used for the sewing. Sewing pattern for the floral motives. Floral motives completed. A4 album. Compared to the A4, the A3 album has proven to bring a few challenges due to its size and its consequent weight. Nevertheless, it was a great project from which I learned a lot, and was a lot of fun to complete! Completed A4 album, which was made prior to commit to the making of the A3 album. Detail of the bone clasps. A4 album. Floral motives completed. A3 album.